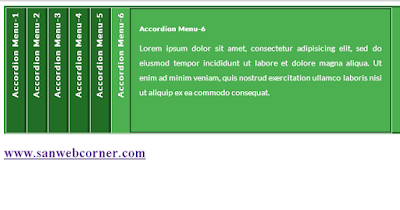 Accordion Menu always very simple to create at a same time this is very useful to heighlight the text and also content compressing because it hides and shows the particular menu content so it is very efficiant way to avoid the maximum space in the webpages. 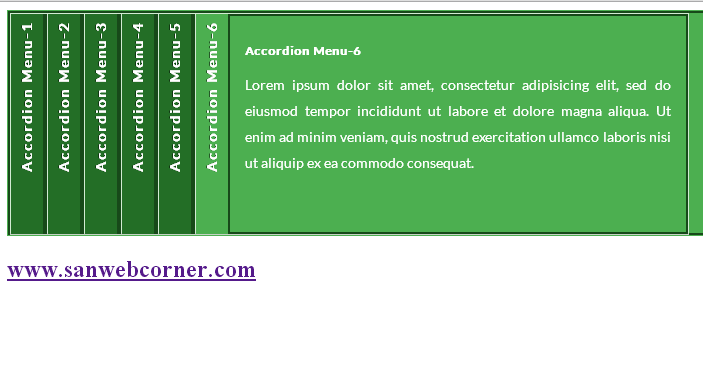 In this example i am going to tell you how to create the Horizontal Accordion Menu using css and css3. Usually all are using the vertical accordion menu. But it is Horizontal accordion menu, It is more attractive when comparing to the vertical one. This is also responsive type horizontal Menu. Normal Vertical Accordion Menu is Here. This was done by using only css3 and html, so it is very easy and simple to implement. The below image shows the how the horizontal accordion menu is looking for, And also code and demo page available to testing purpose. I hope this post is very useful.